There are a lot of beautiful sheep on Lopez, but David and Susan Corbin’s Navajo-Churro sheep are not only beautiful but also unique among Lopez flocks. I talked with the Corbins the other day at their One Clay Hill Farm on Davis Bay Road and learned why they raise this heritage breed native to the American Southwest. From their kitchen window, we watched the flock move across the field and they helped me see the distinguishing features of Navajo-Churro sheep. 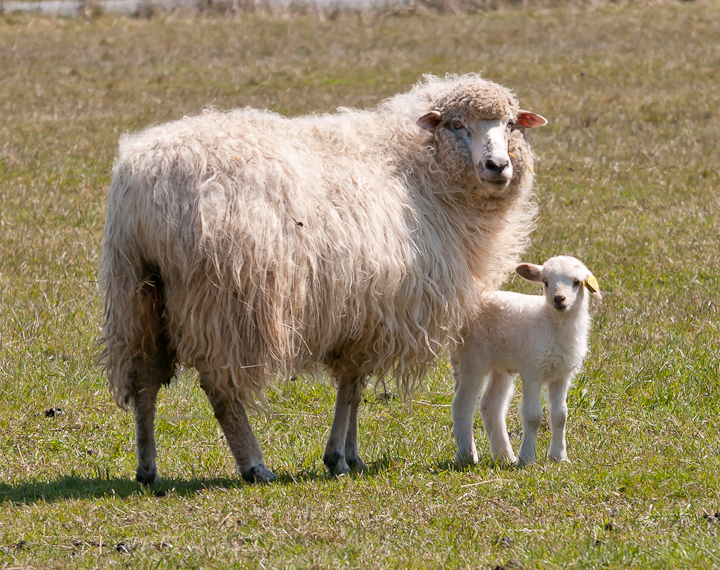 First are the face and legs: both should be free of wool. Next are the horns: the rams have two, three or four horns, often curled or tilted, and the ewes sometimes have two. As they pointed out examples of horns, David and Susan added that horns were “a desired trait among the Navajo” and are one of the breed standards. Then there’s the wool. Susan showed me a chart of fifteen named shades that identify the fleece color of each ewe or ram, and she and David pointed out sheep that matched these colors. There was a white, a descendant of their first ram, a blue from one of their first ewes, some grays, some brown and tan and some browns.